A few days ago we received a beautifully written Trip Advisor review that we want to share with you. Eli Twinks joined us as a guest for one of our first mountain dinners. She is a yoga and personal development mentor, photographer, and artist who has a deep rooted passion for travel and particularly the Sinai. "I have made several desert trips in the Sinai since I began visiting over 25 years ago. Many day trips, mountain dinners and overnight trips too, all so wonderful. Yet something comes along only once in a few years, that sets what you know apart from all other experiences. Welcome, The Bedouin Way. I am trying to find the words to convey just how beautiful this evening was. A mountain dinner arranged for perhaps 10 guests, all relatively unknown to one another. We were collected at sunset from our various hotels and locations, and taken by jeep to perhaps the most beautiful and pretty location I have ever been, so much so I wanted to live there! Absolutely stunning! The drive alone into the mountains is already something to behold, and we arrived to an opening with a jaw dropping mountain backdrop. This area was large enough to feel expansive and spacious and absolutely cosy enough to feel held. I described it as being hugged by the mountains. And with one one acacia tree in the centre of the desert ahead, it was just picture perfect. There was something very magical about this desert location, no kidding when I found out it was called Gate to Heaven. Of course! Having gone on this trip solo with a group of people I had not met before, the atmosphere was remarkably relaxed, and open, and within no time we were no longer strangers to one another as we sat around in a gorgeous circular area, fully cushioned and candlelit. And.....on came the food! I had been on an overnight trip with Sofian one time, and experienced how well he cooks, but this evening sets apart most other trips by their outrageously delicious speciality of slow cooked goat. Goat can be tricky to cook. It has to be cooked just right - and I have eaten it many times, but NOT LIKE THIS! WOW! 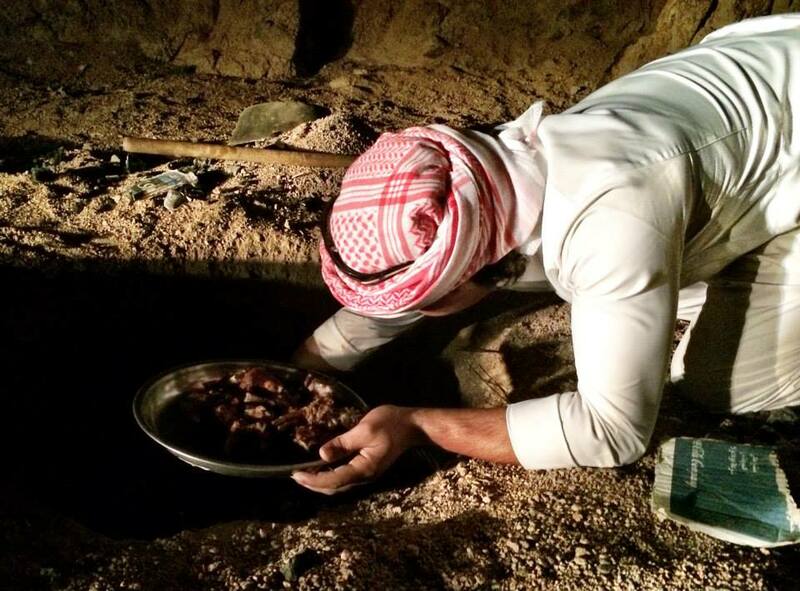 Slow roasted in the ground over hot coals, so tender it fell off the bone. Incredible. And so incredibly flavourful too, it was really like nothing I'd ever had before. We learned how they prepared it (earlier in the day), and Sofian and Mondi uncovered the pit while we were there, seeing first hand how this dish is cooked. The whole banquet, and I say banquet was extremely yummy, and it is totally made with love. Salads, fresh bread, rice and vegetable stew, so even if you are vegetarian you will be totally satisfied. But really something sets the Bedouin Way apart, and that has to do with who is behind it. There is nothing you cannot ask Sofian and Mondi - they are open to listen and to teach the ways they have been raised in. 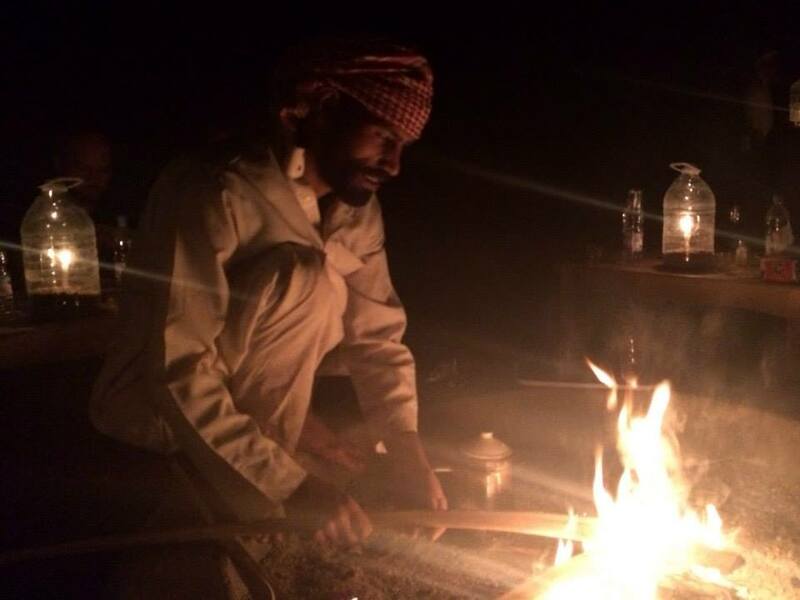 The Bedouin culture is truly fascinating, the more I experience the more humble I become. The more I learn, the more I wish to learn. The more I uncover, the more there is to uncover. 25 years ago changed my whole outlook on life, and it continues to teach me....in the most humbling ways. We have so much to learn from a culture relatively untouched in ways that we have lost sight of. Quiet, earthed, connected, and so graceful. The evening was perfect. Not overly long but absolutely long enough, we were there for about 4 hours, but of course, it is possible to stay longer, or overnight too. Personally i could have stayed the whole week! Plenty of time spent talking, eating, and listening to the quiet, and stargazing! We were treated to a proper stargazing session with a professional telescope. I saw a planet! and it was a rainbow colour! My goodness, it took a while to focus and find one, but once I did I felt I'd seen treasure. So I urge anyone who is looking for a real genuine taste of the desert and of Bedouin life to join The Bedouin Way to experience something humbling, gentle and incredibly valuable by just being there in the presence of, and learning even by pure observation. Not only is the Sinai alone a deeply quietening place, but the company you will be in by these incredible hosts is gold, pure gold. I would choose Bedouin Way every time, for so many reasons where words fail. If you want to give yourself something to remember, something to take home with you and take away in your heart, this is it. COMPLETELY. Thank you Bedouin Way for all that you gave and all that you do. It is invaluable beyond measure." Receive our blog entries direct to your email inbox as soon as they're posted. "I am a Bedouin Woman. Alhamdulillah." Who are the Sinai Bedouin?